When Yuan Shankai, a Beijing-based artist in his late 40s, finalized his divorce in 2010, he decided that if he were going to marry again, his second wife would be either Russian or, at the very least, Eastern European. Fortunately, his job takes him to that region a lot. Through traveling for work, Yuan has met over 30 women from countries, including Russia, Ukraine and Poland, over the past five years. Some he met by chance, others he met through friends or a local marriage agency. "One of the most important reasons, of course, is that the women from these countries are beautiful, and they comply with my idea of beauty," Yuan laughed. "In recent years, more of my friends are also going to these countries to find wives. Some of them already have." According to Yuan's observation, most of the Chinese men who go to Eastern European countries to find wives tend to be affluent and more familiar with the Western culture, lifestyle and value system. Yuan and his friends are an example of the current trend in China in which a growing number of Chinese men are marrying women from Eastern European countries. Earlier this year, a group of eight wealthy Chinese bachelors aged from 25 to 46 went to Khabarovsk in Russia for a group blind date with Russian girls. The date was organized by a local dating agency, and five of them found a match, according to a Daily Mail October 11 report. The founder of the dating agency Elena said in the article that there are more males than females in China, while in Russia, it's the contrary. Elena said that many Chinese men like Russian women because they like how they look, and Russian women like Chinese men because they respect women and want a serious relationship. Yuan initially dated Chinese women after his divorce, but he found that the first thing they cared about was whether he has a house and a car and whether he would spend money on them. In contrast, he said that most of the women he met in Eastern European countries don't care if you are rich or not. "What they really care about in men is whether they have a good character and their attitude toward family," said Yuan. He cited as an example an instance in which he wanted to buy his then girlfriend, a Polish woman, an expensive watch. He said all her girlfriends had the watch, so he thought she would want one too, but she refused his offer. "She told me that it's pointless if she wears a watch just to show off to other people," Yuan said. Instead, he said, she bought a $100-Swatch because she thought it more practical. Yuan also thinks that Eastern European women age more gracefully. Even when they get old, most of the women still look quite graceful, he said. Women from these places are also usually quite cultured, with very good manners. The historical bond and the geographical closeness China shares with the Eastern European countries also help make Chinese men, especially older Chinese men, feel close to women from this region. "China has a rich history with these countries. Russia and Ukraine are all former Soviet countries; we have all heard stories and watched movies about the friendship and stories China shared with these countries. Chinese people naturally feel more close to the people there," Yuan said. For example, he said when he was dating a girl from the Republic of Belarus, the girl and her friends would sing "Katyusha," a song that was famous during World War II, and tell him stories about Katyusha. "I have been listening and singing that song since I was a little boy, so we immediately felt close to each other when we sang it together," Yuan said. Victoria Kurzova, a 25-year-old Russian who works as a TV host in Beijing, said that many Chinese blind date groups travel to Russia to try to find wives. She said the few that have been mentioned in the media are just the tip of the iceberg. Blind date groups are especially popular in small cities and villages where the economy is less developed. Girls from these communities are more willing to marry a foreigner to have a different life, Kurzova explained. "Our country is facing some economic difficulties, and many of the girls in our country are looking for an opportunity to go overseas," Kurzova said. "Sometimes going on blind dates with foreigners is a good choice because they may get a chance to better themselves and find true love at the same time." Kurzova has dated a few Chinese men. According to her, compared to Russian men, who tend to be more chauvinistic, Chinese men are usually more considerate. "Chinese men are more willing to care for their girlfriends and change their habits or plans for a girl, but in Russia, many men don't do that because they think that would make them lose face," Kurzova said. 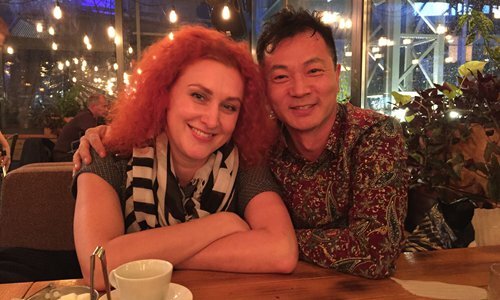 Nataliya, a 37-year-old teacher from Ukraine, has been living in Beijing with her Chinese husband for 10 years. She met her husband when he was working in Ukraine. She said she chose a Chinese husband because she found Chinese men more caring and more willing to commit to their family and the woman they love. Nataliya and her husband were apart for four years before their marriage, after which she moved to China to be with him. During the four years, her husband called her every day, which for her, showed his care and commitment. "In Ukraine, a lot of men don't work and require their wife to shoulder both work and family responsibilities, not to mention that many men have a drinking problem," Nataliya said. "But Chinese men are more willing to shoulder responsibility in the family," she said. Also, the relationship between the couple and their parents is closer in China than in Ukraine, which makes her feel accepted and loved in the family. Many Chinese and foreign agencies have noticed the increasing dating interest from both sides and have started businesses to capitalize on the demand. A keyword search for Russian brides on baidu.com, one of China's leading search engines, reveals many such dating agencies, offering opportunities to meet girls from Eastern European countries. Russian brides have always been a hot export from the country. According to a report by news portal chinaru.info, a Chinese news portal that publishes news about Sino-Russian relations, marriage immigration in the country started around the 1990s, and young women under the age of 30 make up 60 percent of the participants. There are even online dating websites geared toward this sector. One such site, hotrussianbrides.com, which was founded in 2003, adds 1,000 new Russian girls a week to allow men from all over the world to see and communicate with them. According to the chinaru.info report, young Russian women are traditionally more willing to marry men from European countries because the living standards there are more developed. However, in recent years, as China's economy develops, more agencies are turning to Chinese clients. According to Kurzova, some Russian agencies even arrange Chinese language and other custom classes for the Russian brides when they get to China to help them adapt to life in China. While the trend of Chinese men marrying Eastern European women indicates a shift in perceptions, it is still in its fledgling stage and not yet widespread. Yuan said he talked to several overseas dating agencies, and they all told him that only a small portion of the women they enlisted have the intention to marry Chinese men. Also, despite the similar historical background, Yuan said that many of his friends who married Eastern European women have encountered cultural and lifestyle differences, for example, differences in the kind of food they like to eat every day and how they spend their leisure time, which might be challenging for some people. "People should think about whether they really understand and like the culture and lifestyle of other countries and whether they can compromise for each other before they enter a cross-culture relationship," Yuan said. "It's not just the person you marry; you marry into the culture as well."